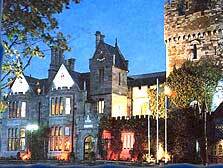 Situated in a quiet peaceful setting Clontarf Castle is one of Ireland's most splendid hotels. The castle is steeped in history and it was constructed in 1172 by Hugh De Lacey. It is also the only hotel of its kind located in the Dublin suburban area. With its magnificent entrance hall and roaring fires Clontarf Castle is an experience not to be missed. The Castle offers a fantastic variety of first-rate guest accommodation ranging from deluxe en-suite rooms to luxurious suites. The hotel boasts three royal suites, four junior suites and seven executive deluxe rooms, each of them fit for royalty. The111 deluxe en-suite rooms are carefully designed and magnificently fitted with every state of the art amenity possible to give an exceptionally high standard of comfort. Facilities even include 24 hour room service, laundry, secretarial and babysitting services. The award winning culinary team at Templar's has created a superb menu, offering a European cuisine with a modern twist, combining dishes from land, sea and air with top of the range new and old word wines to compliments their menus. The Drawbridge is a casual traditional pub serving cavery Sunday to Friday and is popular for private parties, birthdays and anniversary celebrations. The more refined and very popular Knights Bar has a gentle air of serenity combined with sophistication and style. Excellently located in the plush leafy suburb of Clontarf, just two miles from Dublin City Centre. The hotel is within easy access to all of Dublin’s main tourist and shopping attractions as well as the main business districts.